Like their Facebook page to receive the code. This would be a great deal if I actually bought Steam games on Steam but more often than not (outside of sales) I use other retailers such as GMG - they're almost always significantly cheaper. Worth having for an inevitable huge sale though! Handy for buying keys and buying games off russian sellers on steamtrades. always the cheapest. This would be a great deal if I actually bought Steam games on Steam but … This would be a great deal if I actually bought Steam games on Steam but more often than not (outside of sales) I use other retailers such as GMG - they're almost always significantly cheaper. Worth having for an inevitable huge sale though! Agree 100%, might just get this in anticipation for the Summer Sale. An extra £2.50 could go a long way!! 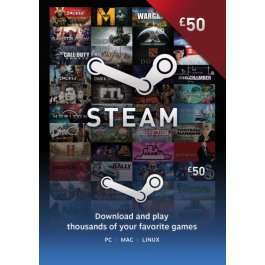 i would be interested to know how many games bought/redeemed on steam are never played or played no more than once..
yay more money to spend on game deals/bundles that i will never playi … yay more money to spend on game deals/bundles that i will never playi would be interested to know how many games bought/redeemed on steam are never played or played no more than once.. Handy for buying keys and buying games off russian sellers on … Handy for buying keys and buying games off russian sellers on steamtrades. always the cheapest. Can anyone even list the code? I assumed it was user specific, but it looks like past codes have been generic. Found Code but after purchasing, it looks like £50 is now out of stock. After redeeming it turns out I've been sent a £20 code. I have contacted them to see how they go about rectifying. I have seen cdkeys posted many time, but have yet to use them until now. I have just check my emails ( I initially was going to leave it - bear in mind it is late evening AND Friday). I have received the response that there was a technical problem, which has now been fixed. To resolve this they have issued me two more vouchers, each £20. I must say, this is very, very good service and I will definitely use them in future. I'm actually more suprised by the speed of the response than the extra credit. where is the code on their FB page? £50 back in stock now, just bought one. Need to wait till tonight to see if the credit works though when I get home. Someone should post this again the everyone can see, the deal is back again.